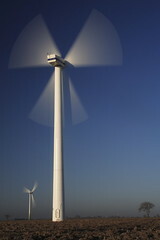 Jerome a Paris’ Wind power set to decline under Obama? highlighted how the on-again, off-again federal renewable energy policies have created a boom-and-bust cycle, with 2009 looking to be perhaps a minor bust after 2008’s record-setting boom period. And, that this might occur despite the Administration and Congressional focus on renewable energy. And, despite our desperate need to get off polluting energy sources via energy efficiency and clean energy production as quickly as possible. Yesterday, however, also say another important item: the wind industry now employes more American’s than the coal industry! Wind: 85,000 workers. Coal: 81,000 workers. And, looking to the future, wind produces more jobs per kWh than coal while producing far (FAR) less environmental havoc. With each passing day, wind energy offers the opportunity for more jobs. As per Jerome a Paris, every megawatt of wind creates about 15 jobs in the year of construction and another 0.4 permanent jobs (or, over a 25-year life cycle, about 10 job-years). Despite the growing demand for coal (both for our own electrons and for export), the coal industry (via mountaintop removal and otherwise) has worked hard not to just get the miner out of the mine, but the miner out of mining. Coal industry employment has dropped 50 percdent since 1986. With the increasing US wind construction, foreign firms are moving ever more of their manufacturing into the United States to meet US demand. And, the actual construction, management, and maintenance jobs are ones that cannot be exported. 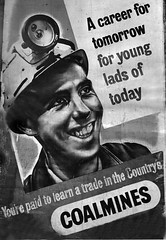 We often hear of the impossibility of taking action on moving off coal due to the JOBS! JOBS! JOBS! issue. Well, the jobs issue is clear: clean energy is the way to go not just due to some esoteric global warming issue, but to spark more and better jobs. And, jobs not just for today, but into the future. 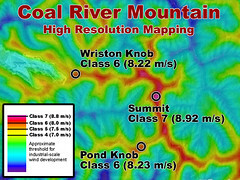 Coal River Mountain, West Virginia, truly represents the front-lines of the coal vs wind battle for our collective future. Rory McImoil Rory McImoil is a key player in laying out a stark alternative: blow the mountains away for the temporary gain of extracted coal (which will run out within a decade) and the long-term pain of a devastated environment and community or invest in wind power that will provide employment and community tax revenue for decades to come. Coal River Wind is the sort of win-win-win-lose battle that will define our future. Lose for the fossil-fool industry and those seeking to live off extractive industries, living lavishly today at the expense of tomorrow. 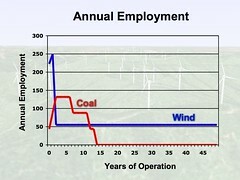 By year 27, the wind-power option would create more local job-years than all the planned strip mines combined. And, year 28 … 29 … 30 … and on are continued prosperity. In addition, this is only the direct jobs, without counting the how the electricity generation revenue would go into the local government as tax revenue (teachers, nurses, police …). And, these jobs would create fewer health implications (has any wind industry employee come down with Black Lung disease?) for the workers and others in the community. And, this process would leave the topography intact (albeit with wind turbine towers), basically eliminate the waste stream (after construction), and be clean, non-GHG emitted power generation for decades to come. But, Massey Energy would lose and they spend quite a bit of money to ‘buy’ the West Virginia political system and to distort the debate. The Energy Smart choice is an uphill battle against such established interests. In addition to any discussions about global warming or mountain-top removal or fly ash, the next time you have a discussion with anyone about renewable power versus fossil fuel remember this: When it comes to JOBS!!! JOBS!!! JOBS!! !, clean energy beats dirty energy, hands down. Faithful at Article XI, the new Commonwealth of Virginia energy/environmental blog. “Virginia mining employment is plunging due to the fact that there is less coal and we are replacing miners with machines to get whats left. This leaves our SW region fraught with some of the worst poverty in the United States.” Yet, Governor Tim Kaine has supported the Dominion Virginia Power and the unWise coal-fired electricity power plant on the the basis of, guess what, jobs. Virginia is one of very few states with zero installed utility-scale wind power. If jobs matter, perhaps that should change. DanaWV at It’s Getting Hot in Here: Take This Jobs (Argument) and Shove It!. My Blowin’ in the Mountains from fall 2007 on Coal River Wind. I recently found your site and am very interested in exchanging links. As you know the linking benefits both of us and will also add value to your blog as we have many Hospital Jobs posted. Description: A Health care Job board focused on Hospital employment. Once you've posted the link, let me know the URL of the page that it's on, and I will post it on our site. I think it's awesome that you started that service, I know of other one that has job openings available through their site, it's not specific to hospitals but it does list those types of jobs along with salary information too.